In the September 2, 2011 fiery truck crash that resulted in the death of its client, Power Rogers & Smith, L.L.P. has uncovered new and relevant information further establishing the defendant truck driver’s liability for the occurrence. Trial lawyer Larry Rogers, Jr., of Power Rogers & Smith, L.L.P., a preeminent personal injury litigation firm in Chicago, Illinois, has identified additional wrongdoing on the part of the trucker involved in a fiery semi-tractor trailer crash that killed a vibrant young woman. On September 2, 2011, a PI&I tractor and trailer struck a cement barrier in a construction zone as it headed northbound on I394. The tractor trailer operator lost control of his vehicle causing it to cross the center median into southbound traffic striking Plaintiff’s vehicle head on. 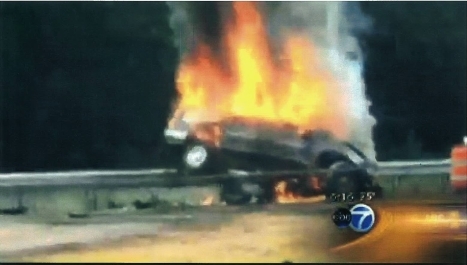 The Plaintiff’s vehicle erupted in flames causing the tragic death of the Plaintiff. During a post-crash inspection of the tractor involved in the fiery crash, a second set of log book entries was located in the tractor cab. The second set of log book entries contradicted the entries in the log books submitted to the investigating State police officers. Through sworn deposition testimony, Mr. Rogers was able to secure the admissions of the tractor trailer operator with respect to the fact that false logs are typically prepared by drivers who are violating the hours of service laws, that it is illegal to maintain a 2nd set of logs, and that log entries were made after the occurrence. The Plaintiff was a lovely woman who worked full time and cared for her disabled brother for decades prior to her death. Her death has devastated her family, friends, and colleagues. This tragedy is one of several that Power Rogers & Smith, L.L.P. is actively investigating and pursuing for its clients. Power Rogers & Smith, L.L.P.has a history and track record of securing some of the very best results for their clients, and where liable parties and their insurers will not fairly and reasonably resolve claims, they will litigate and try their client’s cases to verdict before a jury.